Is The World Ready For BilumWear? Cathy Kata - started the show with the bilum chant. It was one magical occasion! In a cramped space but with enough room to stage a world class art exhibition, Cathy Kata introduced BilumWear to the UK – in London – one of the famous fashion capitals of the world. 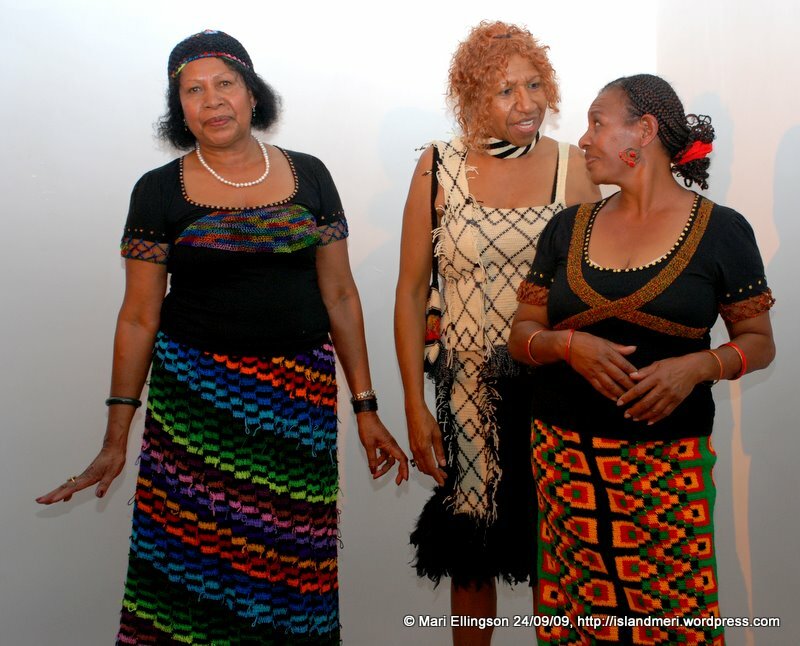 On the evening of 24 September, 2009 amongst Papua New Guinean residents of the UK and avid PNG followers BilumWear made its entrance albeit less grand than the catwalks in London’s Fashion Week and other famous fashion shows in Paris and New York. No-one would have known that BilumWear was introduced in a small quarter of London on that night except those of us who were there to enjoy the show. Almost lost in the other exciting things that make up the life in a big cosmopolitan city. 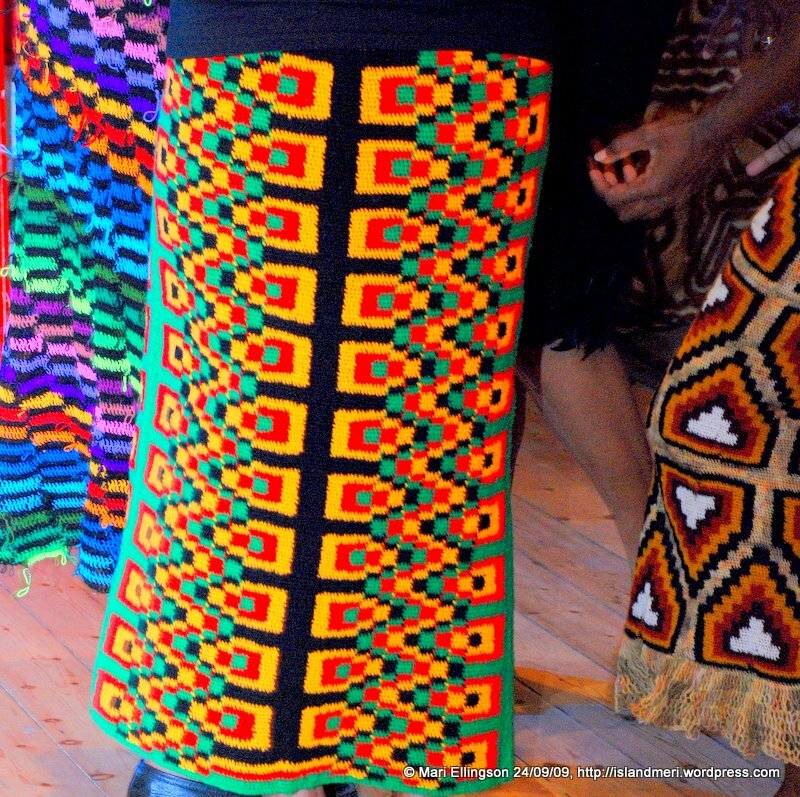 I bet you one day BilumWear – the unique fashion fabric from Papua New Guinea – will be mainstreamed as a fabric worthy of fashionistas – famous or otherwise around the world. Everyone’s always looking for something new to work with and BilumWear is definitely in the ‘something new’ catagory. I was most awestruck with Cathy and with BilumWear – and who wouldn’t! 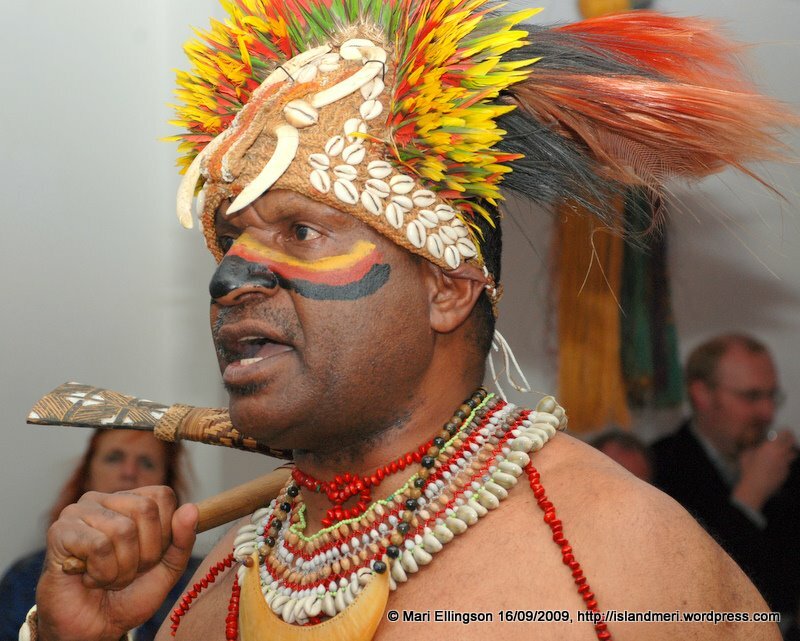 BilumWear is absolutely Papua New Guinean! PNG fashion is experiencing a BilumWear bonanza! It is a fast growing brand name in Papua New Guinea fashion. Why? Because for the first time, the humble fibre which up until recently has been the material used to make totes of various sizes and colours, can now be worn as dresses, blouses and so on. Bilums are found in practically every part of the world. BilumWear is Papua New Guinea’s resounding response to Thai and Chinese silk, English linen and brocade, satin, damask and so on – and fast finding its way into wardrobes in PNG and overseas. 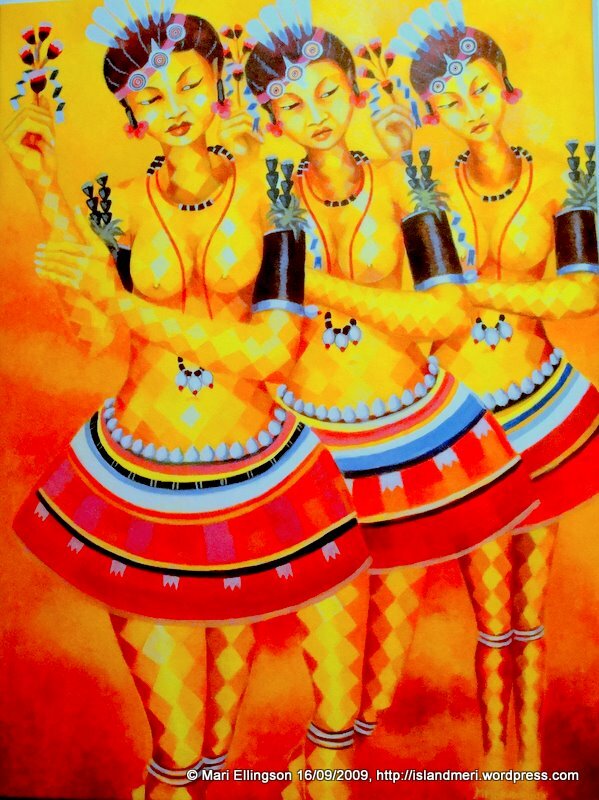 I recently had the pleasure of seeing photos of PNG women wearing BilumWear in PNG and Australia and as faraway as the USA via Facebook albums, PNG and PNG-related blogs as well as on Google. Wow…so what is this fabric we are talking about? Check out a number of blogsites given at the end of this post for more information on BilumWear. 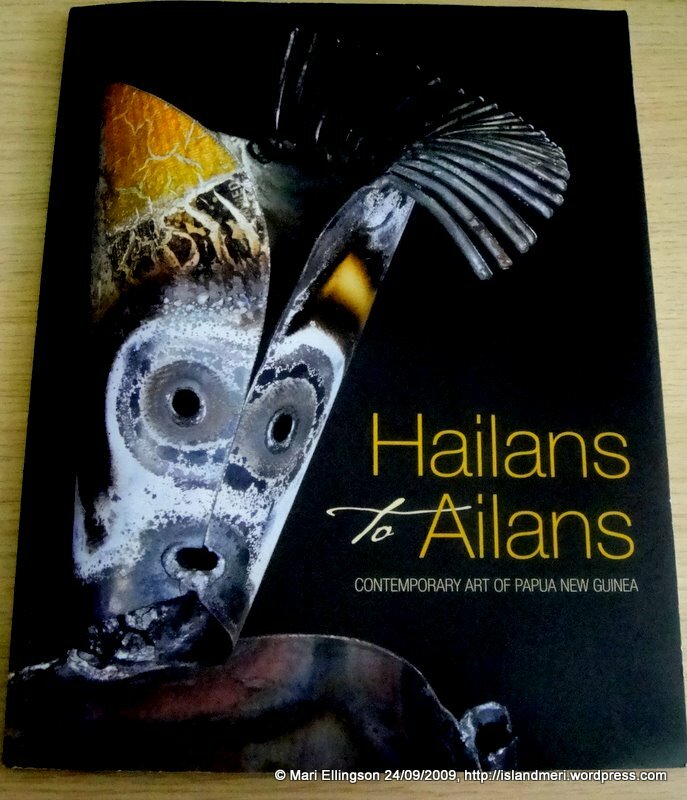 The ‘Hailans to Ailans’ international exhibition of contemporary art catalogue featured an interview with Cathy Kata by Dan Lepsoe. 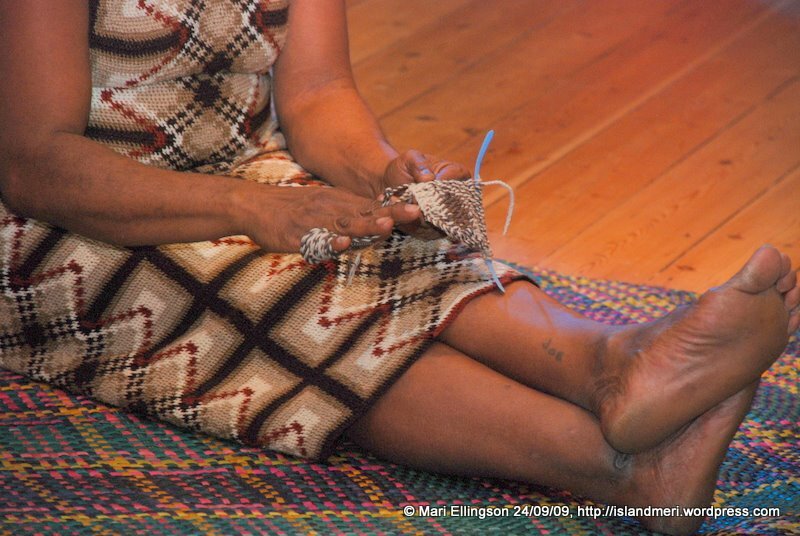 He asked Cathy what the bilum meant to her and she said, “There’s a song in my language that captures this…” and she told the story of how it was the spirits that led a young girl to discover a special fibre and made bilum from it. The making of the bilum in turn became the beginning of life’s journey for the young girl – she grew up, got married, had children and the bilum an integral part of her life – “…So the song really describes the importance of bilum to a woman’s life” said Cathy. BilumWear outfits - simply amazing! I was proud because the exhibition was uniquely Papua New Guinean. 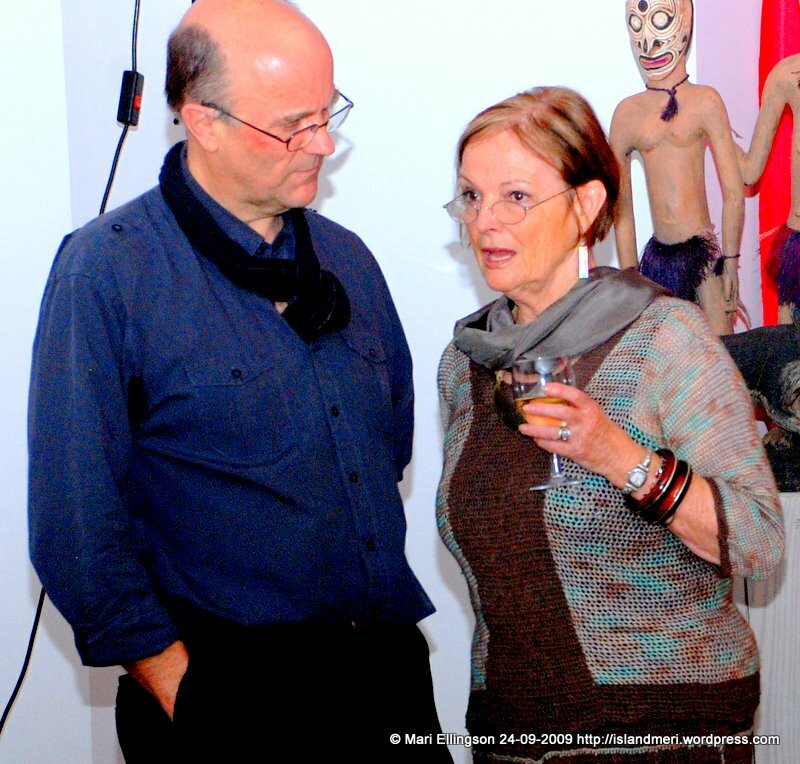 Now Cathy was part of this historic ‘Hailans to Ailans’ international exhibition which opened in London on 16 September, 2009. Another colourful outfit - simply beautiful! From Lepsoe’s interview, I gathered that Cathy’s journey into bilum weaving and into BilumWear was inspired in 2000 by an article of a PNG fashion designer “…who had created a garment with a piece of bilum attached to the pocket.” I am still wondering who wrote that article that woke up the artisitc and entreprenuerial giant in Cathy. I have a few guesses but will keep them to myself lest I am wrong. Will ask Cathy next time I see her. 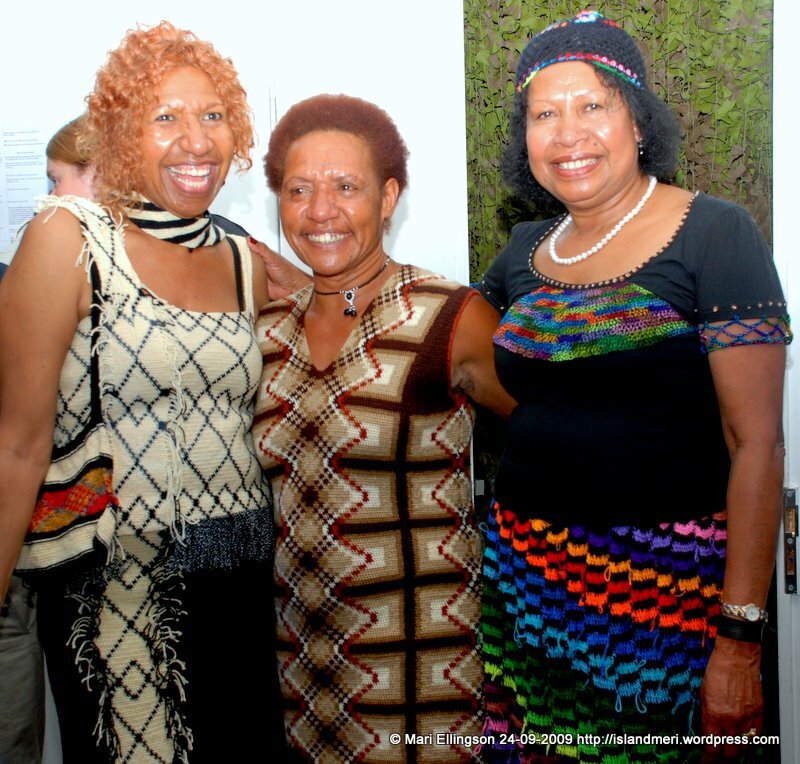 Cathy's BilumWear modelled by members of the PNG community in the UK. Cathy learned bilum weaving or looping from the tender age of 5. Since reading the article on combining bilum material with another fabric she was inspired to create her first bilum product. She made a bilum frock for her daughter’s graduation. This was the step in the right direction – she was doing something she had knowledge of, something she loved and something that opened up new possibilities for her entreprenuerial endeavours. She created her special Cathy Kata BilumWear from that day onwards. The rest, as they say, is history. 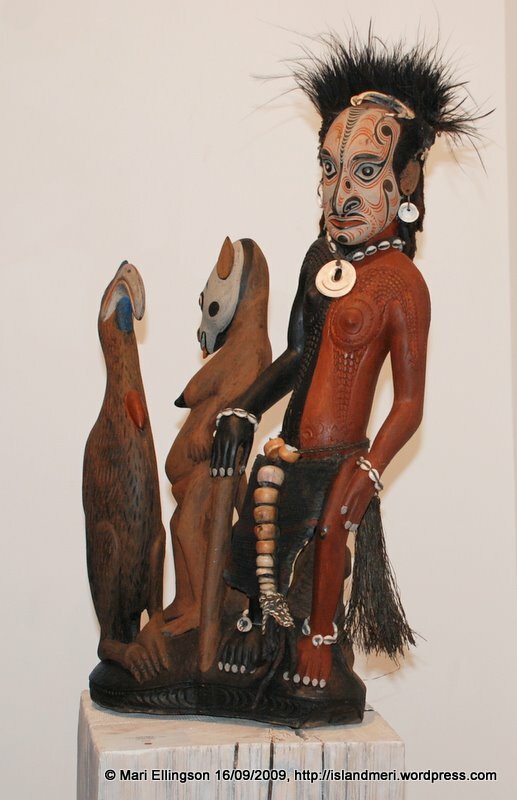 Cathy has participated in a number of exhibitions in PNG and abroad such as this one in London and in 2003 was artist-in-residence at the de Young museum in San Francisco, USA. 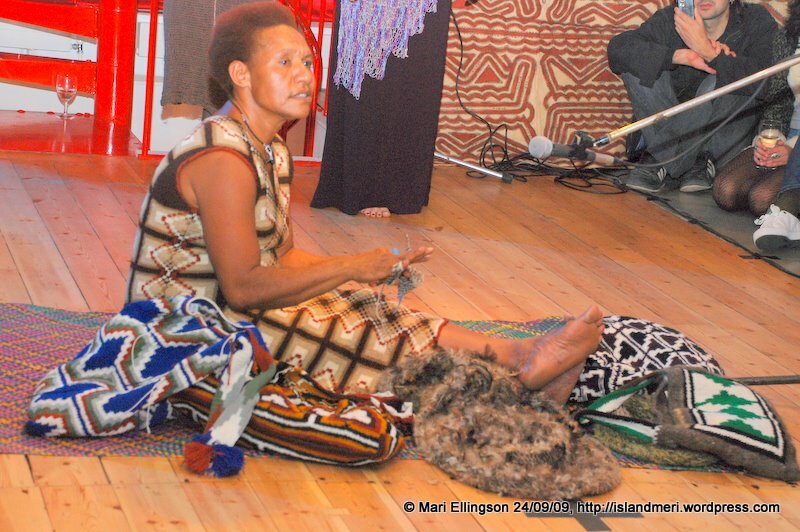 When I received Dr Mel’s invitation (co-curator of the international exhibition) to the the ‘Hailans to Ailans’ show in London, I was really happy and delighted that I would be meeting the creator of bilum dresses made entirely in PNG. I remember reading about her but couldn’t remember when and where. What a wonderful opportunity this would be to meet her and one that I would not miss. BilumWear arrived in London. Amid the splash of bright colours which filled the small space on the second floor of the Rebecca Hossack Gallery. What a night that was. When Cathy started chanting her bilum song and the PNG wantok models took to the makeshift catwalk following a superbly choreographed performance to introduce to the world BilumWear, a great audible sigh of admiration and awe could be heard in the quiet room. As the models danced and swayed I was suddenly overcome with pride as well as the realisation that Papua New Guinea is slowly making its mark in the world through its art and cultural exhibitions. I was so grateful for the invitation to this exhibition. We need more shows or exhibitions like this. 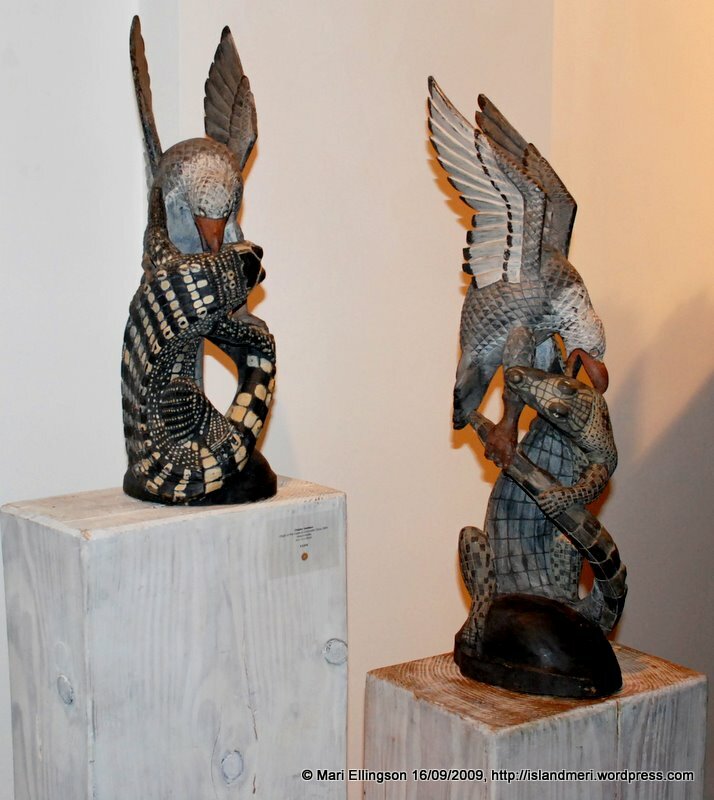 The artists need support in advertising, marketing, and promotion of their works throughout the world. But the kind of support they need must be sustained to be able to make the sort of impact that European art and antiques have made on collectors around the world. 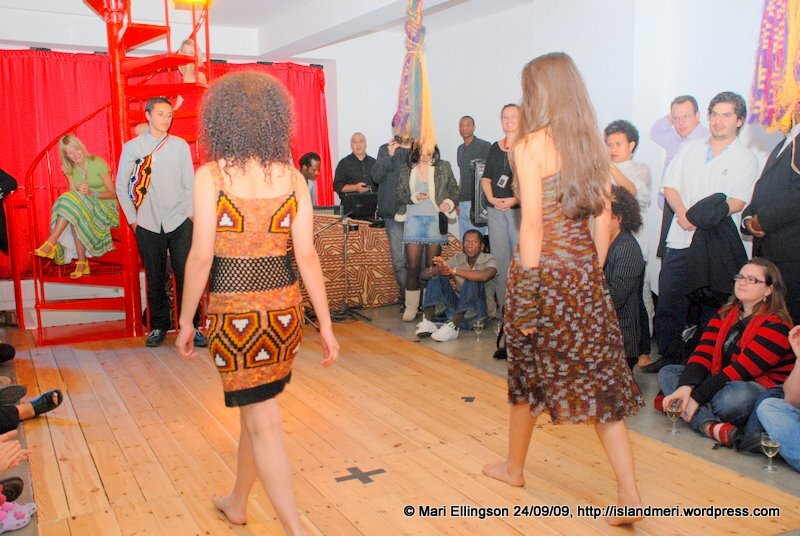 I thank Cathy for being part of the team of PNG iconic artists and bringing BilumWear to London. What a great occasion to introduce BilumWear to Europe than during the week celebrating PNG’s 34th Independence Day in London. 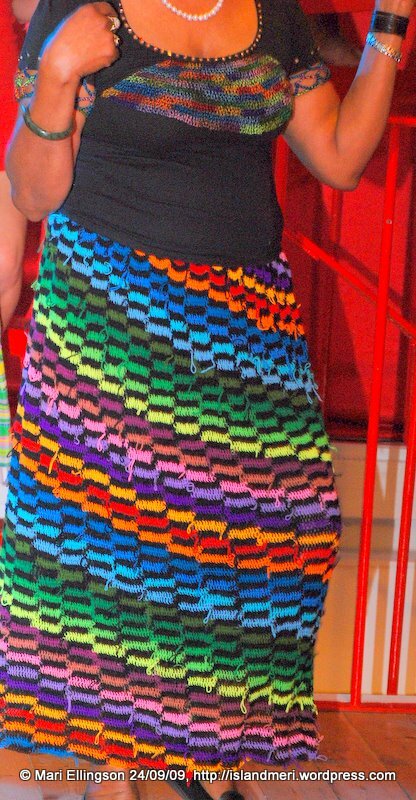 Dr Pamela Rosi in one of Cathy Kata's BilumWear creations - stunning! I reckon that BilumWear will one day find its own place on the catwalks of Europe and America, Asia and the Pacific and Africa. Designers are always looking for new fabrics to work with and BilumWear is not going to remain in the shadows for too long. It only takes a small step and perhaps it was meant that BilumWear made its debut appearance here in London – a fashion capital. 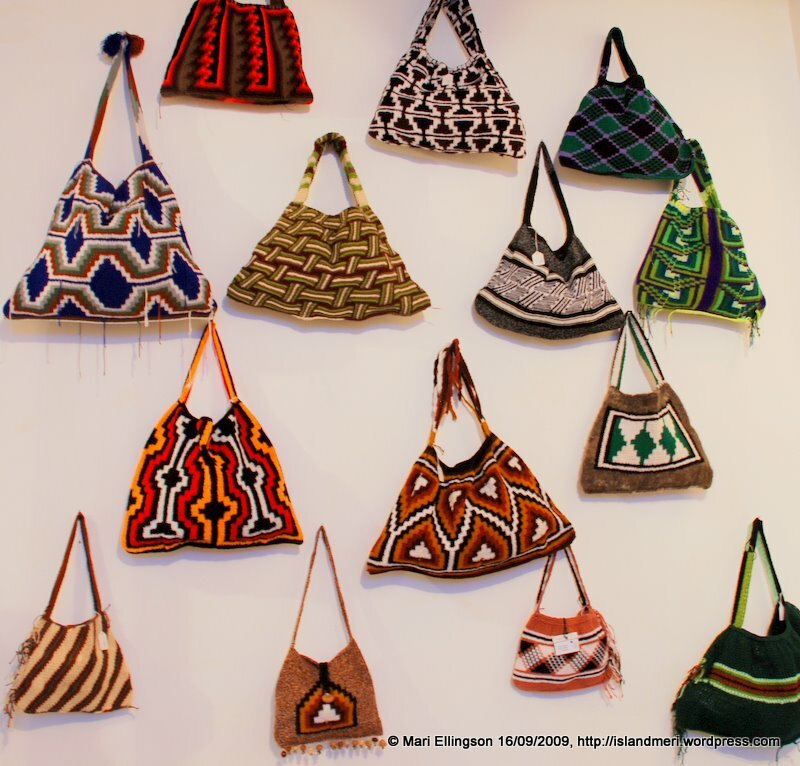 When BilumWear finds its way into wardrobes to suit various dress and pocketbook sizes, Papua New Guinea would have given the world something so unique and most unexpected. That’s right! Something unexpected from the ‘land of the unexpected’. Author islandmeriPosted on 07/12/2009 10/12/2009 Categories FashionTags bilum, Cathy Kata, Fashion, fashion fabrics, Hailans to Ailans, new fashion fabric, PNG BilumWear17 Comments on Is The World Ready For BilumWear?